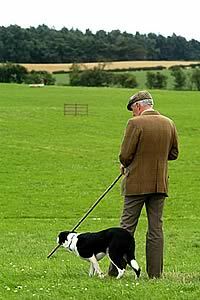 All home nations qualifiers and their dogs are now in place and preparing for the 2011 International Sheep Dog Society (ISDS) World Sheep Dog Trials, Food & Country Festival, to be held at the Lowther Estate, near Penrith in Cumbria, from September 15 to 18. The 4th World Trials - the ultimate global test for working sheep dogs and their handlers - are being staged in England for the first time. A total of 23 nations and 240 handlers and their dogs, representing the cream of the world’s top triallists, will compete. Teams from Brazil and Japan will making their debut in this year’s World Trials, joining dogs and handlers from England, Ireland, Scotland, Wales, Austria, Belgium, Canada, the Czech Republic, Denmark, Faroes, Finland, France, Germany, Italy, Netherlands, New Zealand, Norway, Portugal, Sweden, Switzerland and the USA. Larry, Cowper, Keswick. Dog: Fleet. Mark Elliott, Lazonby, Kirklinton, Carlisle. Gail & Spot. Raymond MacPherson MBE, Kirklinton, Carlisle. Don. David Harrison, Selside, Kendal. Ben. Joe Relph, Borrowdale, Keswick. Dylan & Mac. Derek Scrimgeour, Threlkeld, Keswick. Zac. Arthur Temple, Holmrook, Cumbria. Meg. Richard, Briggs	, Lancaster. Dog: Bill. Chloe Cropper, Dean, Bacup. Ned. Stephen Duckworth, Haslingden, Rossendale. Spy. Richard, Hutchinson, Littledale, Lancaster. Wenndale Roy. Tom Lawrenson, Brindle, Chorley. Spot. John Carter, Delabole, Cornwall. Moons Park Jen. Eamonn, Lawless, Ryde, Isle of Wight. Bill & Maddie. Carol Mellin, Oakworth, Keighley, West Yorks. Maisie. Val Powell, Cold Ashby, Northants. Mint. Ben Smith, Ashbourne, Derbyshire. Guto & Meg. Ian Brownlie, Alloa, Falkirk. Dog: Mo. Neil Campbell, Kinross, Moray. Gus. Andrew Carnegie, Comrie, Perthshire. Lark. Stuart Davidson, Sandbank, Argyll. Jim & Rob. Duncan Robertson, Helensburgh, Argyll. Sweep. Bill Elliot, Kelso	, Roxburghshire. Rod. Peter Hetherington, Maybole, Ayrshire	. Lynmar Hemp. Julie Hill, Heriot, Midlothian. Kim. Scott Renwick, Ullapool, Ross-shire. Roci. Ewen Mackinnon, Strathcarrow, Ross-shire. Nan. Hamish MacLean, Westhill, Inverness. Kim. Peter Martin, Glen Lyon, Aberfeldy. Maid. Joe McRobert, Biggar, Lanarkshire. Taff. Alasdair Mundell, Moffat, Dumfriesshire. Taff. Michael Shearer, Thurso, Caithness. Rob. Alex Watson, Shotts, Lanarkshire. Jake. John Welsh, Dalrymple	, Ayrshire. Tanhill Sweep & Tanhill Nap. Robbie	Welsh, Patna, Ayrshire	. Maid. Ian Wilkie, Inverurie, Aberdeenshire. Nell. Jane Drinkwater, Lampeter, Ceredigion. Dog: Trefynor Tarn. W.P. Lloyd Jones, Tregaron, Ceredigion. Fynydd Davey. Glyn L	Jones, Llangollen, Denbighshire. Zak. Thomas Ellis, Maelor Whitchurch. Ladd. Kevin Evans, Libanus, Brecon. Spot. Jeff Evans, Ystrad Meurig, Ceredigion. Shinehill Jim. John Griffith, Caernarfon, Gwynedd. Fan. Daniel	Jarman, Tywyn, Gwynedd. Jaff. Alan Jones, Bala, Gwynedd. Bet & Casi. Richard Millichap, Dyffryn-Rhondda, Port Talbot. Dewi Tweed. Graham Powell	, Kington, Powys. Gwen. Mervyn	Price, Builth Wells, Powys. Mac. Cyril Roberts, Llanwddyn, Powys. Tweed. Jed Watson, Brecon, Powys. Mirk. Nigel Watkins, Llangadog. Floss & Jody. Pennant Williams, Mold, Flintshire. Dale. Denis Birchall, Dunlavin, Co Wicklow. Dog: Bill. Peter Concannon, Ballyhaunis, Co Mayo. Rob. Michael Hopkins, Castlebar, Co Mayo. Lass. Mike Glynn, Cong, Co Mayo. Jim. Thomas Doherty, Ballybofey, Co Donegal. Sweep. Charlie	Flood, Letterkenny, Co Donegal. Tod. John Harkin, Convoy, Co Donegal. Killiebrae Jock. Sammy	Long, Ballybofey, Co Donegal	. Lad. James McCaffrey, Pettigo, Co Donegal. Cap. James McGee, Ballybofey, Co Donegal. Becca. William Gallagher, Kilcar, Co Donegal . Lady & Groesfaen Roy. Seamus Robinson, Termon, Co Donegal. Ridge. David Corrigan, Newbridge, Co Kildare. Ben. Matthew Murphy, Rathangan, Co Kildare. Roy. Frankie McCullough, Ballynahinch, Co Down. Craig & Jake. John Maginn, Newry, Co Down. Mozz. Ivan Stevenson, Ballymena, Co Antrim	. Tweed. Michael, Gallagher, Ballymoney, Co Antrim. Cap. Seamus, Gallagher, Ballymena, Co Antrim. Glen. Gerard Graham, Portglenone, Co Antrim. Jess. John O'Brien, Cahir, Co Tipperary. Shep. Billy Ryan, Julianstown, Co Meath. Dan. In addition to the 240 qualified dogs, there are 102 alternate dogs entered. Qualifying rounds will take place on three separate fields on the first two days of the trials, with the top seven from each field on the opening days going forward to the semi-final on the Saturday. The top 16 of these qualify for the final on the Sunday, from which a world champion will emerge. Public interest ahead of the four-day spectacle is gathering pace for what will prove one of the highlights in this year’s northern events calendar. Supporting the World Trials is a Food & Country Festival showcasing local food and a cookery theatre, rural crafts and skills, with a host of displays, creating all-round family appeal. Advance four-day tickets at a discounted price are now available for purchase online via a link on the World Trials website at or through the ISDS. Sponsors of the 2011 World Sheep Dog Trials include CSJ Specialist Canine Feeds, of Bodfari, Denbighshire, dog food manufacturer Gilbertson & Page, of Welwyn Garden City, Herts, Penrith & District Farmers Mart, Sainsburys, A.W. Jenkinson Forest Products, Clifton, Penrith, North West Auctions Lancaster, H&H Farmstock Auctioneers, Brokers & Valuers, Carlisle, Craven Cattle Marts, Skipton, Dent Farming Co, Armstrong Watson Accountants, Carlisle, Eden District Council, Lord Lonsdale, Nigel Davis Solicitors, Burton-in-Kendal – Nigel is chairman of the 2011 World Trials organising committee – NatWest Bank, Valtra Tractors, Lloyds Land Rover, Carlisle, Adams & Co Chartered Accountants and Eden Independent Insurance Brokers, both based in Clitheroe. An overseas sponsor is Albert Scheper, of Scheper ClinMon in The Netherlands – Mr Scheper is chairman of the trial committee of the Dutch Border Collie Club.